Rochas Okorocha, Imo State Governor has challenged the National Chairman of the All Progressives Congress, Adams Oshiomhole, to compare their achievements as governors. This is coming on the heels of Oshiomhole’s condemnation of Okorocha’s government, during the unveiling of Senator Hope Uzodinma, as the Imo State APC candidate. Okorocha, in a statement yesterday by his Chief Press Secretary, Sam Onwuemeodo, said only such publication of their achievements would end the insults from Oshiomhole. The governor said what he has achieved in less than eight years as governor are far higher than what Oshiomhole did as governor of Edo State for eight years. He said: “We won’t allow Oshiomhole to eat his cake and still have it. Nigerians should judge between the two who failed as governor after a publication of their achievements. If Oshiomhole fails to accept this challenge, we won’t have any other option than to conclude that he is just a noisemaker. 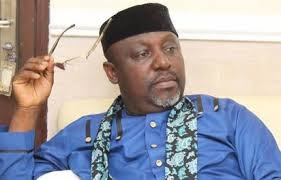 Okorocha further accused the APC chairman of choosing to abuse at the rally, rather than marketing Uzodinma, who is his party’s governorship candidate. “Media reports on what Oshiomhole said at the rally were all about Okorocha. He consciously avoided telling Imo people why they should opt for Uzodinma at the 2019 poll. He also failed to tell them why he chose him as the gubernatorial candidate of the party in the state. “On the issue of salary that he talked about, the information has long been in the public domain that Okorocha paid the December salaries of workers in November 2018. He has also given each of the workers N10, 000 as Christmas bonus,” he said. The statement added that only last week; the state government donated an ultra-modern office complex to the Nigeria Labour Congress (NLC). The governor added that while these gestures show the harmonious relationship between Okorocha and the workers, on the contrary, Oshiomhole owed Edo State workers seven months salaries before he left office. Okorocha also accused the APC chairman of failing to pay the Edo workers the N18, 000 minimum wage, making him unqualified to talk about wages. He denounced the APC rally, which he said was empty, a sign that the governor is more popular with the people, and not the unholy alliance that Oshiomhole is foisting with Abuja-based Imo politicians.